The first thing I must mention in this quasi review is the amount of oglers and inquisitors that the ECR has left in its in its wake so far in South Africa. Granted, it is a sight to behold. I think it probably draws comparison to the timeless expedition-built overland vehicles that frequently roam the bush and tackle big trans-African adventures, strapped with gas-cans, spare lugged tires, gear trailers and canvas tarps that provide temporary shelter to the intrepid travelers that spend days behind the wheel in order to reach remote and rugged places. “Give me the streets of Manhattan!” Walt Whitman demanded, and he had them—miles and miles of crowded, chaotic alleys and avenues, patchily paved with cobbles, wood blocks, or gravel or simply covered in dirt. Whitman waded joyously into foaming currents of traffic, and maybe the risk of being crushed to death by a wagon or a streetcar was part of the lyric thrill. A century and a half later, the sociologist William Helmreich strolled nearly every block in New York City—6,000 miles—on streets that have been designed and redesigned for the complex choreography of striding, rolling, biking, shuffling, and driving. Helmreich doesn’t focus on the surface beneath his soles in his book The New York Nobody Knows, but his, and everyone’s, experience of getting around the city is inflected by a vast menu of design details. The next time you cross the street, watch where you’re going. Look closely at the symphony of signs and crosswalks, bollards, lanes, and dotted lines. The sidewalk dips gently to the roadbed to let a wheelchair pass, the transition marked with a panel of bumps that catch a blind person’s cane. A few strategically placed blocks of granite guide traffic around a pedestrian plaza. Sidewalks reach out to meet the crosswalk, shortening the trip from curb to curb. A row of parked cars divides a bike lane from moving traffic. A strategically placed bench gives a parent a place to stop and tie the children’s shoes. "The answer is: trail. Trail is the difference between where the bike's front wheel contacts the ground and where the steering axis (drawn through the fork of the front wheel) meets the ground. Well-designed bicycles have negative trail--that is, the wheel contacts the ground behind where the steering axis meets the ground. When you tilt, the trail causes the wheel to turn, thus converting the tilting motion into a turning motion"
Read the author's original (and incorrect) response. 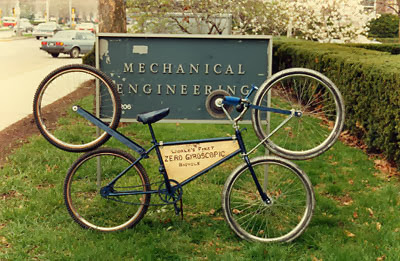 Read more about Professor Richard Klein's Zero-Gyroscopic bikes. And all this time I thought I was the luckiest bike rider ever! 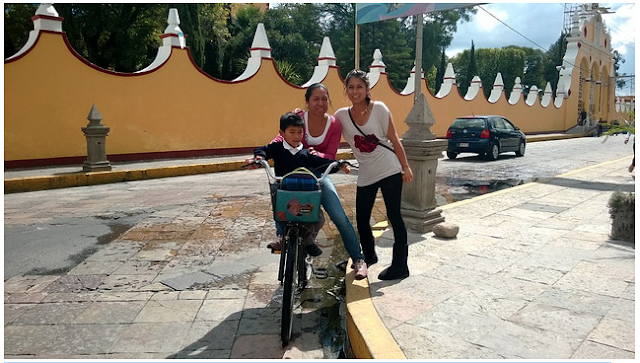 POLITICS VERSUS TRADITION: MEXICAN BICYCLE TOWN FIGHTS FOR COUNTRY’S FIRST SLOW ZONE. Guest writer on Copenhagenize, Giovanni Zayas, is a founding member of Cholula en Bici and a junior partner in an architecture consulting firm. Cholula, located in the central state of Puebla, Mexico, is a municipality made up by three towns: San Andrés, San Pedro and the smaller Santa Isabel. Together they are part of the metropolitan area of the state capital, the city of Puebla, the fourth largest in the country. Famous for being home to the pyramid with the world’s largest base and a church on top, Cholula is one of the oldest living cities in the continent. Cholollan, the náhuatl word that the current name derives from, translates to “water that falls in the escape place”. It is a clear reference to the city’s ages-old role of accommodating several cultures throughout its existence. 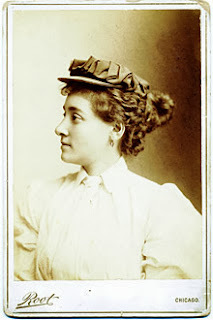 Annie “Londonderry” Cohen Kopchovsky (1870–1947) was the first woman to bicycle around the world. 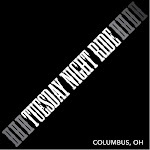 Redline BMX Flight Clinic with Alise Post and Jason Carnes from RaysMTB on Vimeo.